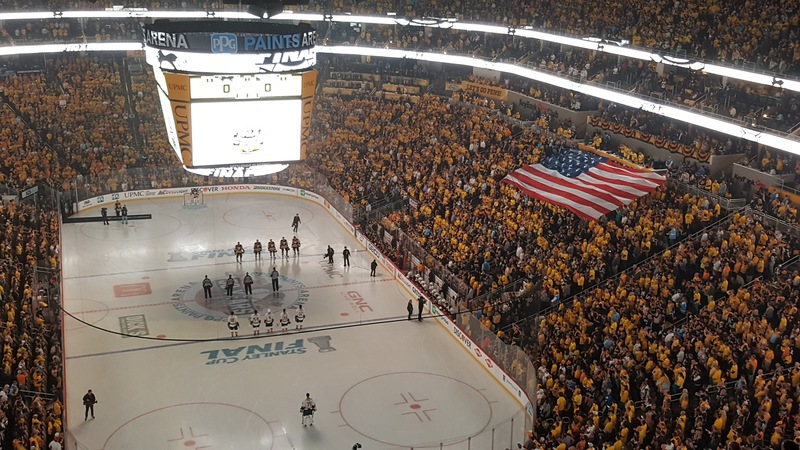 After the Penguins clinched the Eastern Conference final in a thrilling double overtime in game 7, Jen and I decided to see if we could manage to catch a Stanley Cup Final Game. 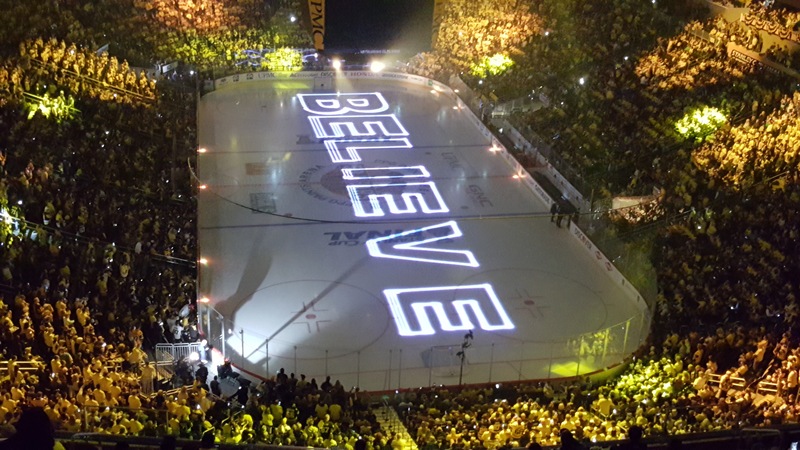 After finding tickets to game 2 in Pittsburgh and applying airline miles, we were on our way. But since game 2 fell on a Wednesday night, we both had to work. So our itinerary was short. We spent only 12 hours in Pittsburgh but it was fun. We were working in Florida at 2:00, eating Primanti’s at Market Square at 6:30 and hitting our seats in PPG Arena at 8. By midnight we were at my parent’s house in Lebo, and at the airport by 5:30 am and I was back in my South Florida office by 10:30 am Thursday. Exhausted. Oddly, upon arriving at Pittsburgh International, we tried to get Uber but there were none at the airport. Instead of waiting the estimated 16 minutes, we hopped on the 28X bus that was sitting there. It was $30 cheaper and just as fast. In South Florida, we have a few Primanti’s Brothers. But I try to explain that these restaurants aren’t like the ones in Pittsburgh. We hit the Primanti’s at Market Square and Jen noticed, “Oh, no pizza.” She was lucky she had a seat and a menu. Loved the atmosphere outside PPG Paints Arena and the viewing party. Great concept. The NFL could learn a little something there. When we got our tickets, I immediately went on line for the 3D view. I realized we were second row from the top and was a bit skeptical of our view. Holy still great seats! 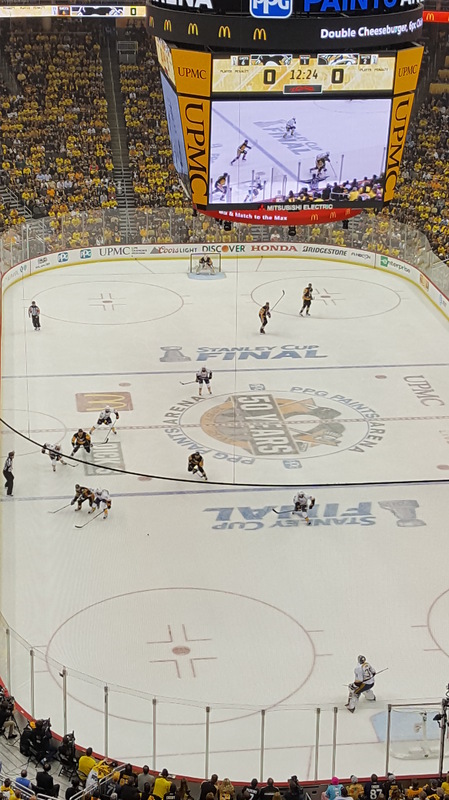 We sat behind the Predator net and saw all 4 goals slide across. The 50-50 raffle hit $100,000. We didn’t win. Very impressed that the entire crowd sang the National Anthem. Jen is a Flyer fan but she was an great sport, immediately pulling the yellow ‘Let’s Go Pens’ t-shirt over her head. She also commented on what a great sports town Pittsburgh is. We hit the team store before the game. I wanted an official game puck and found a display. However, the only pucks we could find were for Games 1, 3 and 4. I dug my hand into the back of a shelf and managed to get my hand stuck with a puck in it. Don’t ask. Inexplicably, a puck fell through the back of the shelves and bounced along the floor. Everyone stopped and stared. Jen picked up the rogue puck and said, “Here’s a Game 2 puck.” It was meant to be. My lucky puck. I eventually got myself unstucked after finding the lucky puck. I fell out of my seat. Seriously, I was sitting on the edge of my seat as the Penguins were pressuring, and slightly stood, only to have the seat fold up on me right as I sat back down. I squatted back and grabbed Jen, laughing. Jen thought she had missed something in the game and that I was doing a dance. Nope. Jen loved the chili. Sigh. We went straight from the airport to the game so packing for the trip was tough. I have a sling bad that fits my phone, toothbrush, wallet, charger and a pair of underwear. Jen hates this bag because it’s practical and not stylish. At security I was pulled aside and told to not wear the bag because of all the recent bombings. Jen was easily amused as she breezed past security.